On February 14, Ambassador Liu Xiaoming met with Richard Burn, HM Trade Commissioner for China of the UK at the Chinese Embassy. Ambassador Liu noted that since last year, China-UK relations have maintained steady development with fruitful results in their cooperation in the field of economy and trade. The bilateral trade reached 80.44 billion dollars, exceeding 80 billion dollars for the first time. China’s investment in the UK in the past five years is more than the total of the previous 30 years. Currently there are more than 500 Chinese companies in the UK. China-UK cooperation on the Belt and Road Initiative is continuously deepening and broadening. This year, China will host the second Belt and Road Forum for International Cooperation and the second China International Import Expo. 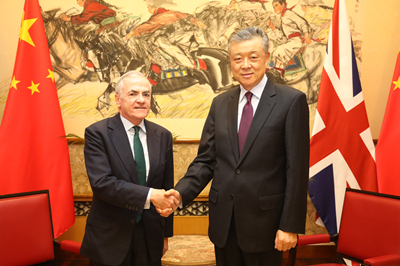 The Ambassador encouraged British companies to take an active part in the Expo. At the same time, he hoped that Britain would provide a fair, transparent and non-discriminatory business environment for Chinese companies. Burn said that last year, China-UK cooperation on trade and investment made great progress, and British exports to China grew substantially. HRH The Duke of York and the Rt Hon Liam Fox MP, Secretary of State for International Trade, led a delegation to the first China International Import Expo. It was a great honour that President Xi Jinping specially visited the UK Pavilion at the Expo. Britain is ready to participate in the Belt and Road Initiative actively and strive to achieve more tangible results. The British side will adhere to free trade and open economic policies and welcome more Chinese investment to the UK. He hoped that in the new year, the two sides would work together to promote the continued development of China-UK “Golden Era”.